I started doing yoga as an alternative form of physical therapy for one major reason: back pain. I work as a photographer, so I am constantly bending, crouching, and standing for extended periods of time. Being tall and thin, the muscles in my spine are extremely weak. I needed a way to relax and regenerate my muscles after a long day of photographing, and I discovered that the Cow and Cat pose are the perfect two yoga positions for this. Step 1: Lay down on your mat and support yourself with your elbows. Step 2: Get into cow pose. Step 3: Check your knee positioning. Make sure your left knee is directly underneath your left hipbone and your right knee is aligned directly under your right hipbone. Step 4: Check your arm positioning. The space between each of your palms should be equidistant from the space between each of your knees. Step 5: Your fingers on both hands should be spread to fully support your body weight. 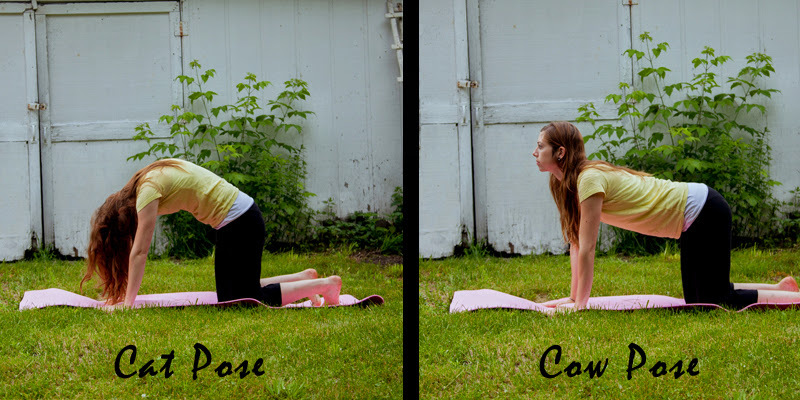 Step 6: You are now in cow pose. Stay there for 3 breaths. Step 7: Flow into cat pose. Collapse your back and bring your spine up towards the sky. Drop your head, and let your neck relax. Stay in this position for 3 breaths. Step 8: Flow back and forth from cat pose to cow pose. After a few transitions, you should feel your spine, and the muscles aligning it, tingle with a warm sensation. This is because new blood is flowing directly to those muscles, helping them to become oxygenated for healing and repair. Getting Crafty With Exercise: How to Spin Up Your Workout Routine!